Stop by H&S Feed & Country Store and take advantage of our November savings on Equine Senior Horse Feeds. Save 50 cents a bag on Equine Senior and Equine Senior Active. Savings run November 1-30, 2018. Purina Equine Senior Horse Feed is scientifically formulated to support the unique needs of senior horses and help support the aging immune system. Formulated for older horses, especially those that may be losing body condition due to poor digestion, dental problems or missing teeth. 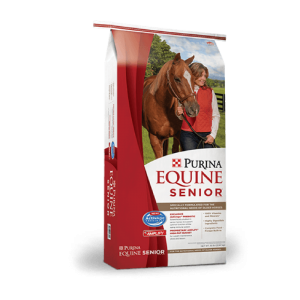 Purina® Equine Senior® horse feed, the trusted original senior horse feed, has been helping senior horses live healthy, long lives since its national launch in 1993. Today’s horses are staying active longer than ever, and new findings suggest that healthy aging horses may benefit from a higher-calorie diet designed with controlled starch and sugar and balanced nutrients. So Purina introduced Equine Senior® Active Healthy Edge® (now Equine Senior® Active) horse feed, precisely formulated to meet the unique nutritional needs of moderately active senior horses. But Purina’s Ph.D. Equine Nutritionists and Veterinarians never stop researching new ways to address the specific needs of aging horses. Amplify® high-fat nugget and ActivAge™ prebiotic are just two of the senior horse nutrition breakthroughs included in Equine Senior® Active horse feed. This entry was posted on Wednesday, October 31st, 2018 at 11:17 pm	and is filed under Events, News & Updates, Specials. You can follow any responses to this entry through the RSS 2.0 feed. Both comments and pings are currently closed.